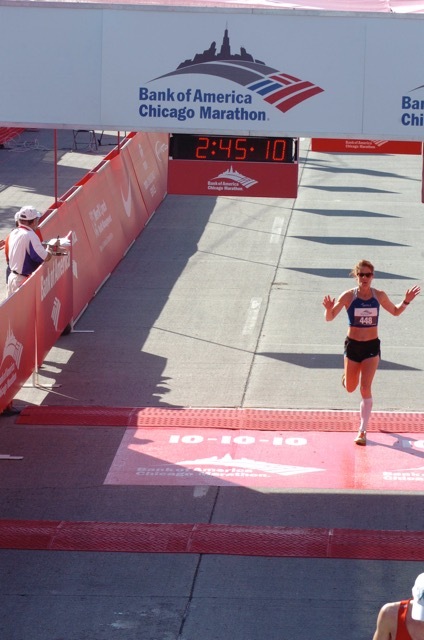 After 3 years of working together, masters runner Jaymee Marty lowered her time by 10 min and qualified for the 2012 Olympic Trials – 2:45:09! A review of the research reveals a well -designed training plan for masters runners can boost fitness by naturally elevating testosterone, human growth hormone levels and running economy. Research in the Journal of Strength and Conditioning found that people over 50 who identify running as their main source of exercise can lose five percent of their leg strength per year. A decrease in leg strength is often correlated with increased injury rate. A loss in strength reduces a runner’s running economy (RE). Studies from Australia have shown that RE is the most important variable for long distance runners and sets elite athletes apart in terms of performance. What is running economy? According to Strength and Conditioning Coach, Karl Gilligan, “running economy is the energy demand for the given speed of the runner. Runners who have good running economy use less energy and therefore less oxygen than runners with poor RE at the same speed. As such, there is a strong association between RE and distance performance, with RE being a better predictor of performance than VO2 max in elite runners”. A 2013 study investigated the effects of two strength-training protocols on running economy. The 16 masters marathon runners were randomly assigned to a maximal strength-training program, a regimen of moderate resistance training or a control group. The runners continued to follow an endurance-running schedule consisting of four or five days of training per week. After six weeks, the maximal strength-training group showed a 6 percent improvement in RE at marathon pace, translating into 6 percent less energy used while running the same pace. The moderate resistance group that used the same exercises but with lighter resistance showed no such gain. A 6 percent improvement in running economy equates to about 50 seconds faster for a 40 min 10k runner. The stronger your legs are the less amount of muscle force is needed for each stride thus the runner runs faster at the same effort level. How do you fit this research into your own training? I suggest to begin with running specific body weight or light weight exercises for 8 weeks. You then would transition into circuit training for another block of 8 weeks and lastly incorporate a blend of circuit training combined with plyotmetrics and maximal running specific training twice per week 8 weeks prior to competition. An example of maximal running specific weight training is three sets of three to four reps of walking lunges and 1 legged squats using a weight that is 85 to 90 percent of the max you can lift. In November’s Runner’s Edge coaching tips, I will review the research on how to design a training plan to naturally increase your hormone levels for optimal performance.